Nifty Daily Chart: Is this topping? Nifty on the daily chart seems to hit a sloping downward trendline (marked in white line) and RSI too turned down from the overbought zone in today's session. 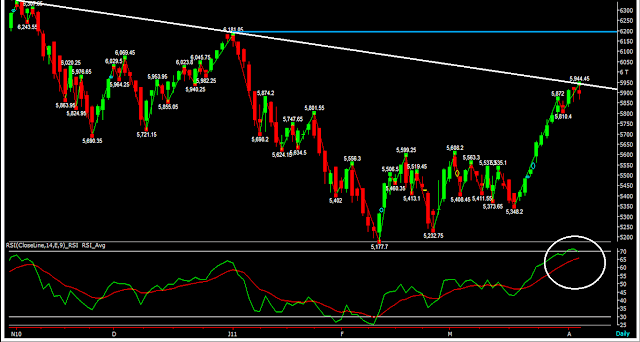 There are also a possibilty for nifty to march towards 6180 (marked in blue) before it turns down. Well we would get an answer in tomorrow's session. For the moment we are not turning negative and waiting for a close below 5865. Kindly do not enter long at this stage.